Angel wing plants are begonias that grow up to 5 feet tall and bloom with large clusters of white, pink, orange or red flowers from May to October. Native to the tropics, this plant thrives outdoors in areas with high humidity and lots of light. In cooler regions, however, angel wing begonias have become a popular house plant. In order to get this plant to flower you need to create just the right environment for it. Plant the angel wing plant in part sun/part shade and rich, organic, well-drained soil. If you reside in a region where frost occurs, plant the angel wing begonia in a pot with drainage holes and good-quality potting soil so you can move it indoors for the winter. Water the angel wing begonia, keeping it slightly and consistently moist until it starts growing on its own. Once growth occurs, you can let it dry slightly before you water again. If you over-water this plant it will grow but will not produce flowers. Fertilize regularly with a houseplant fertilizer formulated for flowering plants. Follow the directions on the package, as each brand differs, but cut the dose in half. Angel wing plants are particularly susceptible to over-fertilization and salt accumulation in the soil. 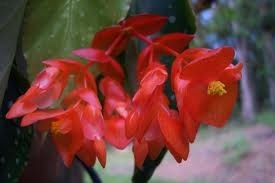 Cut back the angel wing begonia with pruning shears if it starts to get leggy. This is best done in winter. Otherwise, a light pruning every two or three years will help produce more growth and more flowers. If the edges of the leaves start to die this means that the humidity for the plant is too low. Increase humidity indoors with a humidifier or a tray of pebbles filled with water under the pot for better growth. 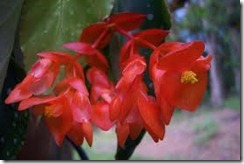 If your angel wing begonia does not bloom this is probably because of low humidity or low light.